Citation Information: J Clin Invest. 2018;128(1):108-109. https://doi.org/10.1172/JCI97839. The molecular clock in Drosophila. In the major feedback loop of the Drosophila clock, the PER and TIM proteins inhibit activity of their transcriptional activators CLK and CYC at a specific time of day. 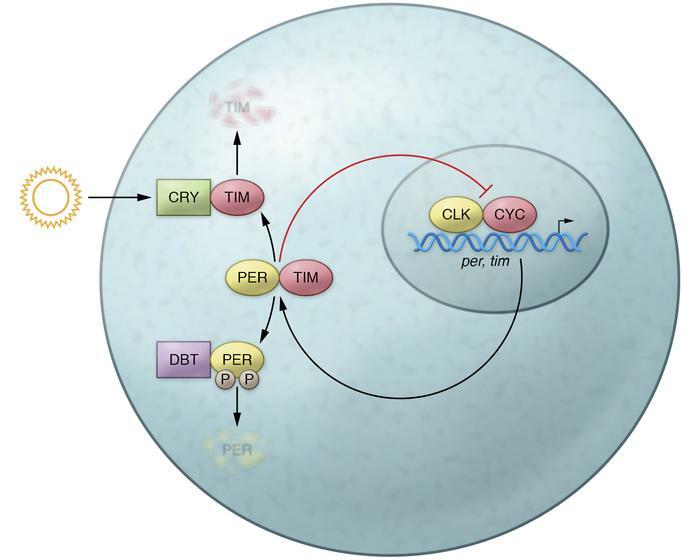 Cycles of PER and TIM expression and activity are maintained through rhythmic transcription as well as through timely phosphorylation, degradation, and nuclear expression of the two proteins. Phosphorylation of PER by DBT (CK1ε) destabilizes it, an effect that is countered by TIM expression in the early night. Entrainment of the loop to light involves degradation of the TIM protein in response to signals transmitted by the cryptochrome (CRY) photoreceptor. In addition, the visual system can also entrain the clock. The figure is focused on the early findings that led to the awarding of this prize and does not include additional components, including interlocked loops, that are now known.